November 9, 2016 November 4, 2016 / J.K.
Level – His style makes it moderate, but the book covers topics like biology, physics, philosophy, anthropology, economics, and of course, history. So, not everyone will be able to jump right into this book. Fairly long at almost 500 pages. 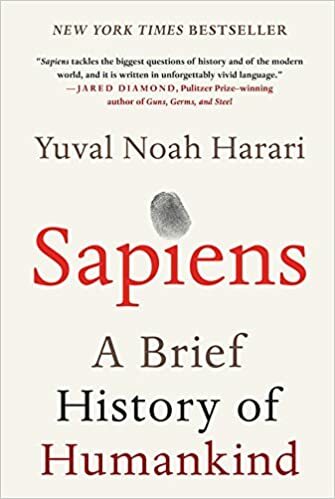 Harari splits the book into four parts (total of 20 chapters), The Cognitive Revolution, The Agricultural Revolution, The Unification of History, and The Scientific Revolution. You could also see this book as two books. The first two parts deal with the developmental historic and biological evolution of humans. The last two parts, deals more with philosophy, religion, end economics. The first two parts are exactly what they sound like. Who were the Sapiens, and how many species were there? Why did we, homo, become dominant? Our cognition, broadly speaking, is the answer. He gets a little philosophical on wondering whether the agricultural revolution was good thing. He is fairly critical, wondering if we would have been better off as hunter-gatherers. The third, was the most fascinating. In ‘unification’ he means how cultural forces tied as together as a species. He points to money, empires, and religion as the greatest reasons. For pure learning/knowledge of society the two chapters on money and religion are probably the greatest in the book. The final section is party what it seems, what has changed since the scientific revolutions, but Harari also offers great insight into science replacing religion, economics (especially capitalism), the industrial revolution and an interesting look into the future. Parts of this section were difficult to read, especially as he discusses human actions (like genocide) through the lenses of biology and evolution. He wraps up with a look at the future and the advancement of medicine. The implications of current advancements and the possibility of true immortality leads to great points on the philosophical issues of no death, and whom could attain it. I’m a pretty big history nerd and find pre-recorded history especially fascinating. What happened to spark the cognitive revolution 50,000 years ago or the agricultural one 10,000 years ago is extremely intriguing from a historical, religious, and biological standpoint. If you are in any way like this, this book is a must read for you. As for the last two parts, if you are an economics or recent history nerd, this is also a must read. Particularly of interest is his definitions of money and religion. It’s a great over view of the basic economics of money. Even looking at the physical aspects of not having to carry wheat to pay for things, or having to know the value in weight of all commodities. Some people will probably not agree with his definitions of religion, but they are quite good from a sociological standpoint. The last half of the book should bother a number of people. For the more conservative groups who may read it for the history and economics insights, his discussions of the problems of capitalism and the industrial revolutions may anger them. Likewise, liberals who cheer on those parts will likely disagree with the assessment that liberalism is, in fact, a religion. They may find it especially repulsive that he as he describes the world through purely secular and biological reasoning, he inevitably concludes that there is no universal truth. With no universal truth, he argues, we can’t state for a fact that things like the Holocaust are wrong. He points out that there is no right and wrong in biology. Our goal is to perpetuate the species, whether or not it is better for us. He discusses evolutionary examples that are not the best winning out. Natural selection is misunderstood as the propagation of the best attributes, but this is simply not true. I’ve heard this type of thinking, especially the Holocaust example, from Christians before. Typically, I dismiss it as something taught in academically weak fundamentalist apologetic schools. It was startling to read it so blatantly stated, and even proved to be correct. His writing is great and though the material could be a text book, it is written in a wonderful, almost narrative fashion. If either of the two broader section of the book are things that interest you, this is a must read. However, due to the depth and breadth of this book, I’ll put it as something to put on your list, if the topic are of interest to you, or if you are interesting in learning. The amount you will learn from this book is fairly astounding. For that reason alone, it would be helpful for many people to read.